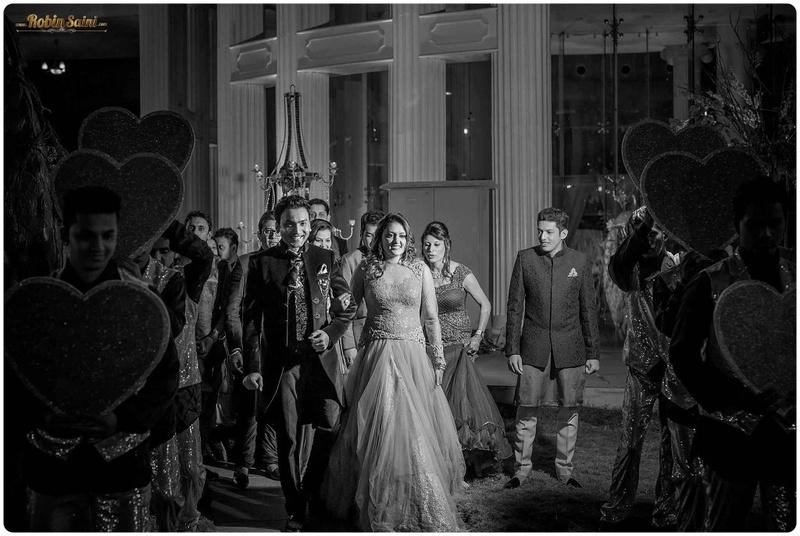 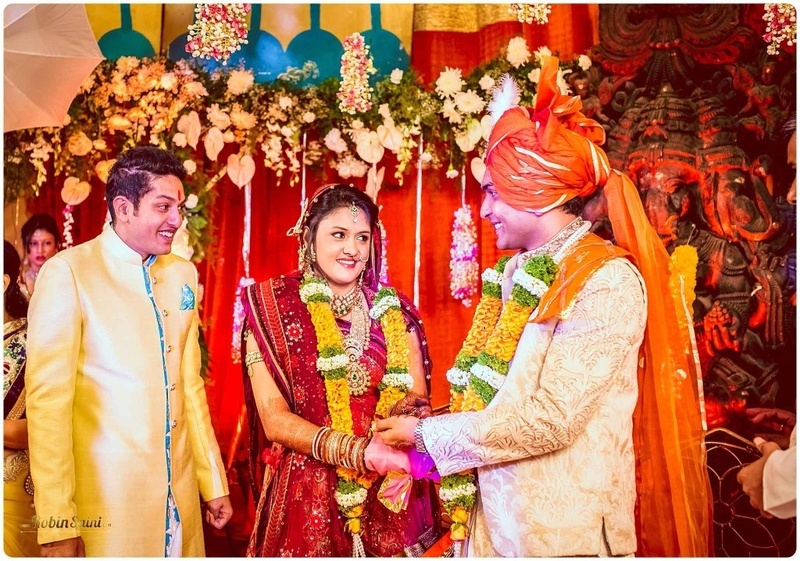 The Big Fat Wedding of Prajal and Sunny is nothing less than one of those uber desi Karan Johar movies – no kidding. 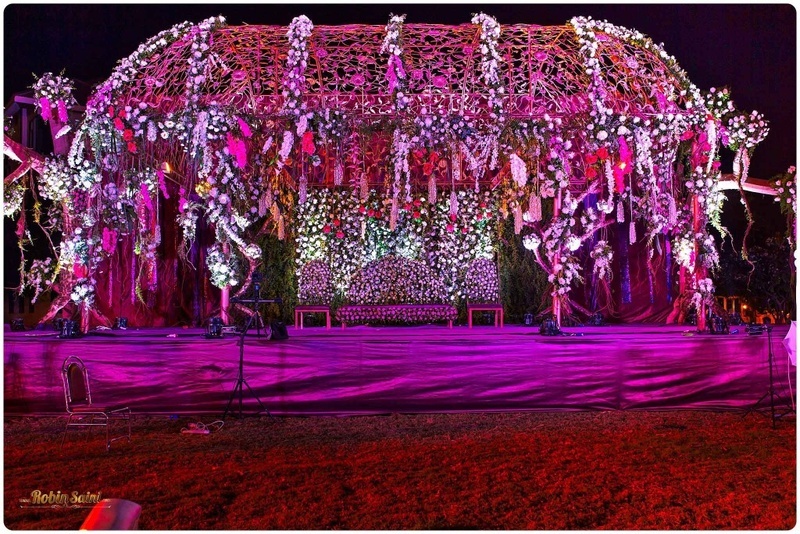 Glistening lights, ravishing outfits, back-up dancers and floral décor galore – each element was done in the grandest way. 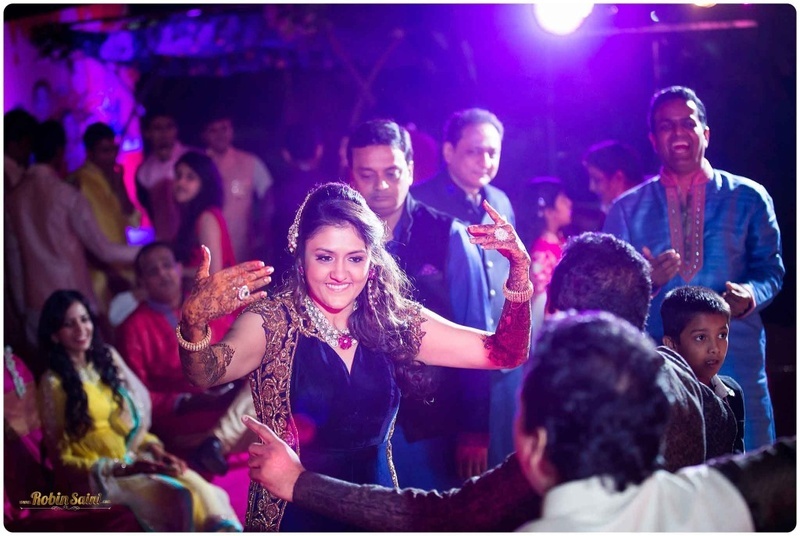 Celebrations began with the Bollywood themed Mehndi, where we felt the true desi vibe right at the entrance. 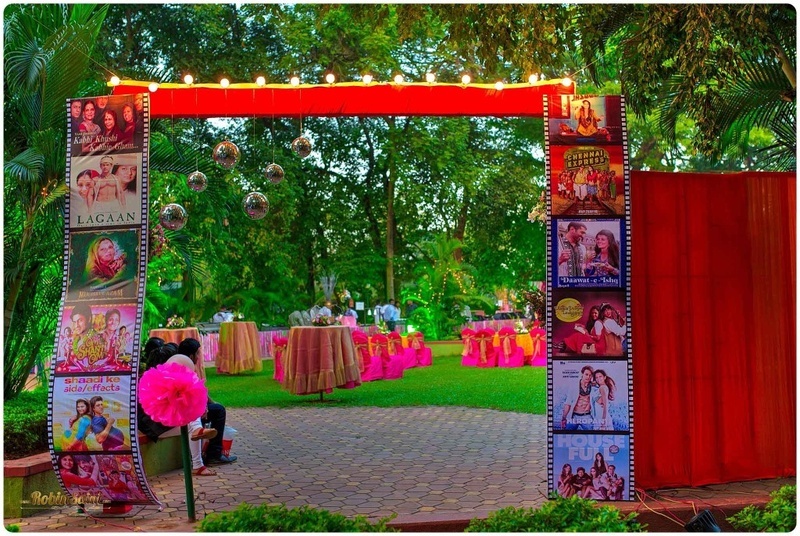 Along with the disco balls and the yellow lit bulbs was the filmstrip with various movie posters photoshopped with the bride and grooms faces! 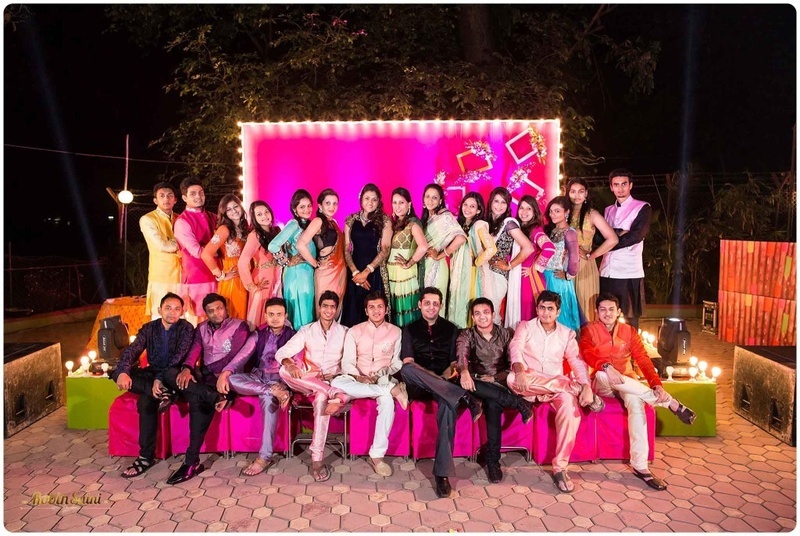 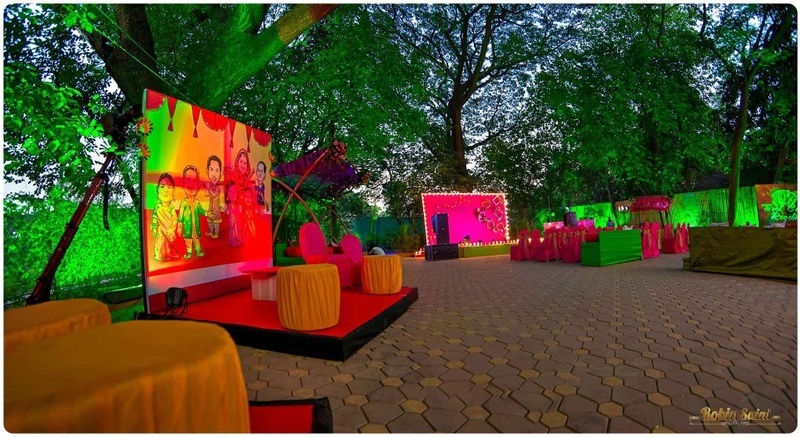 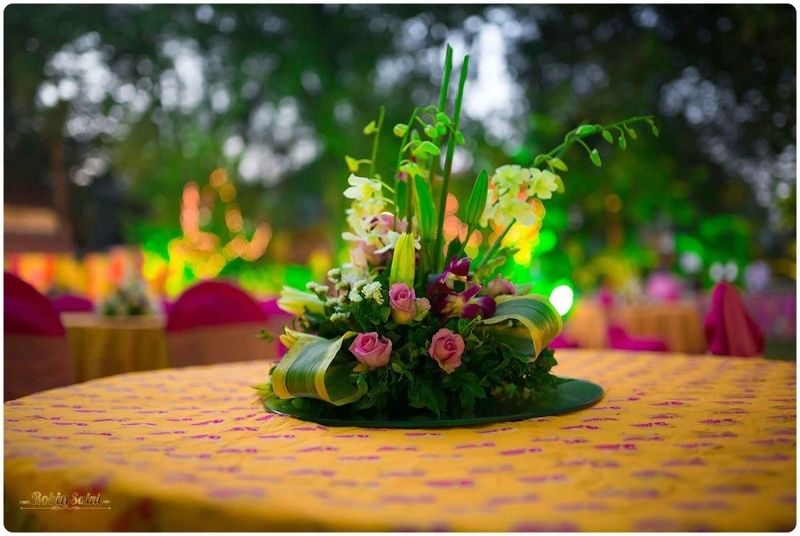 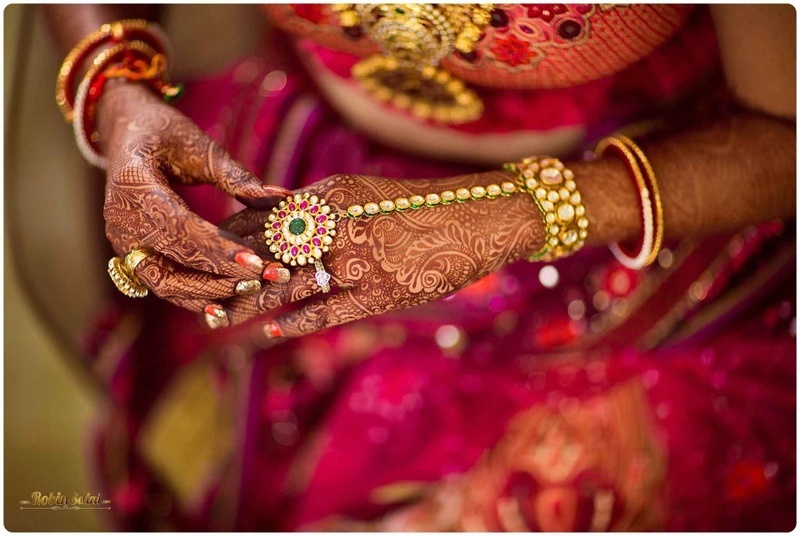 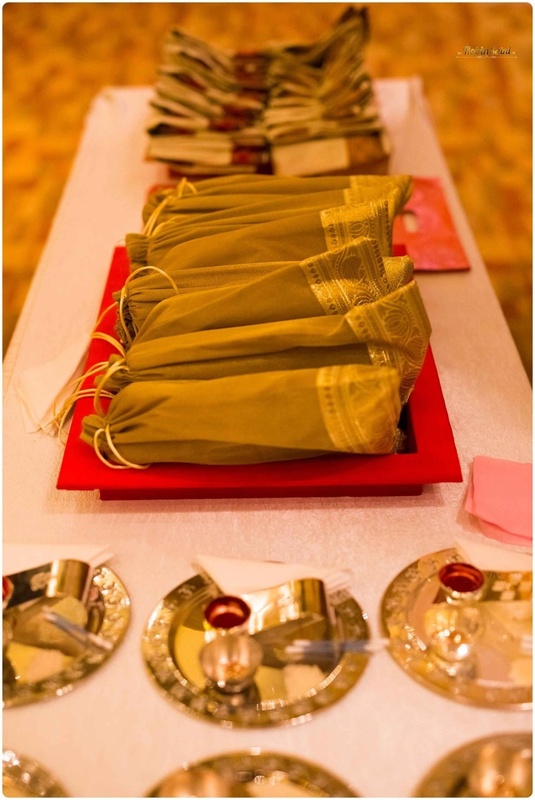 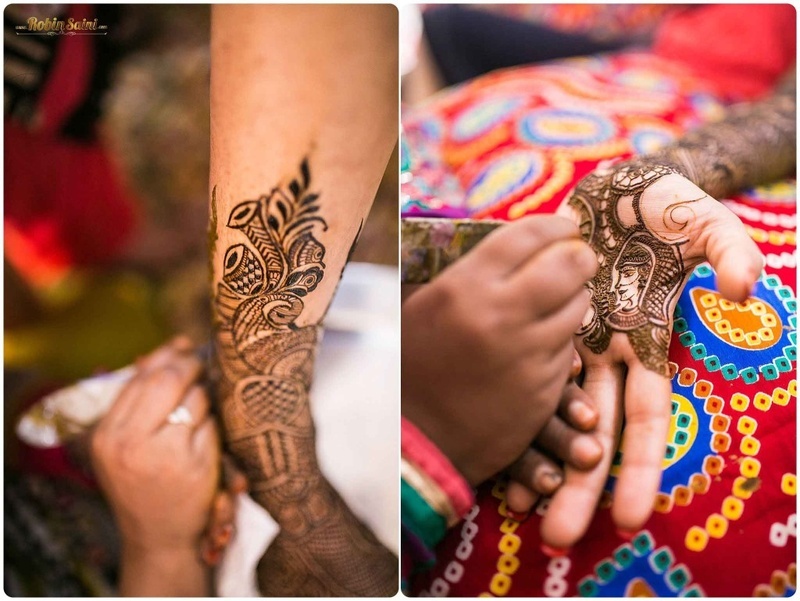 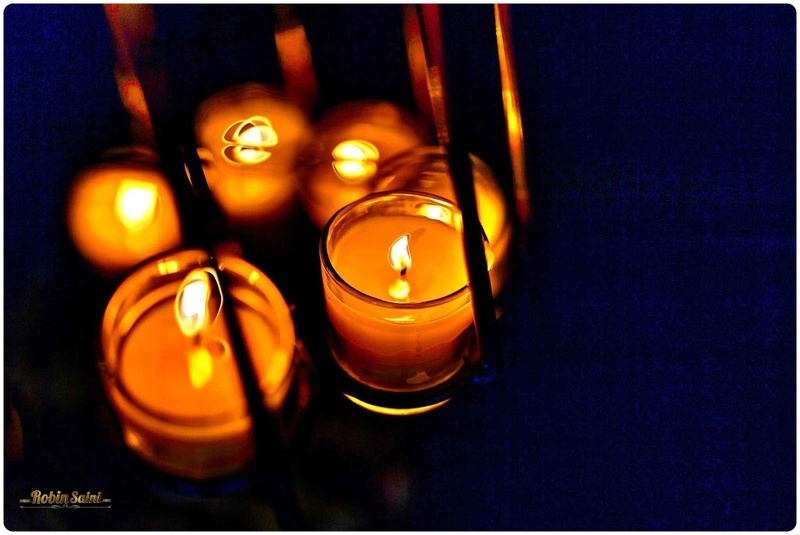 – What a great way to personalize an outdoor mehndi ceremony. 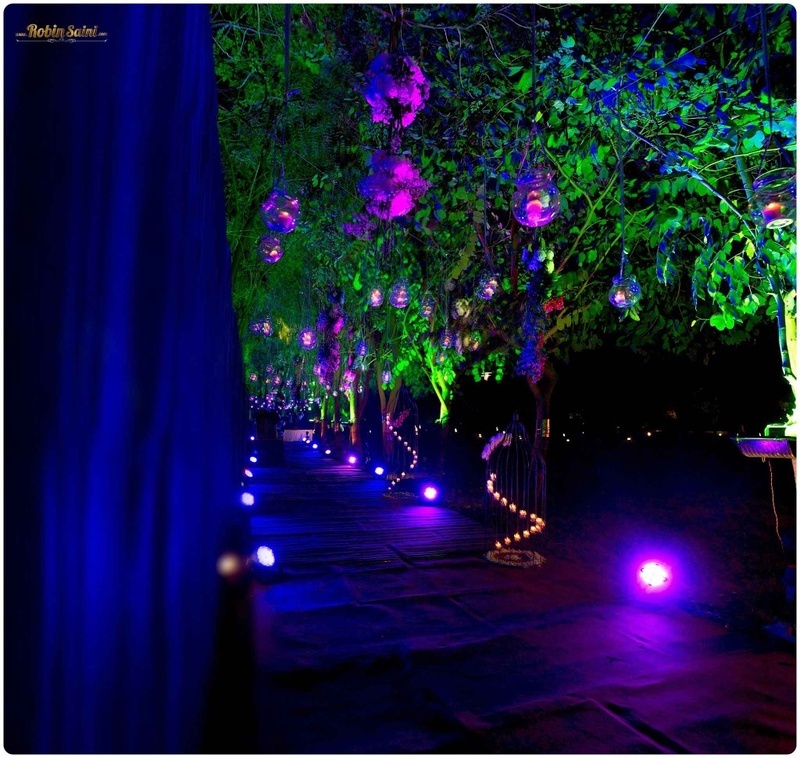 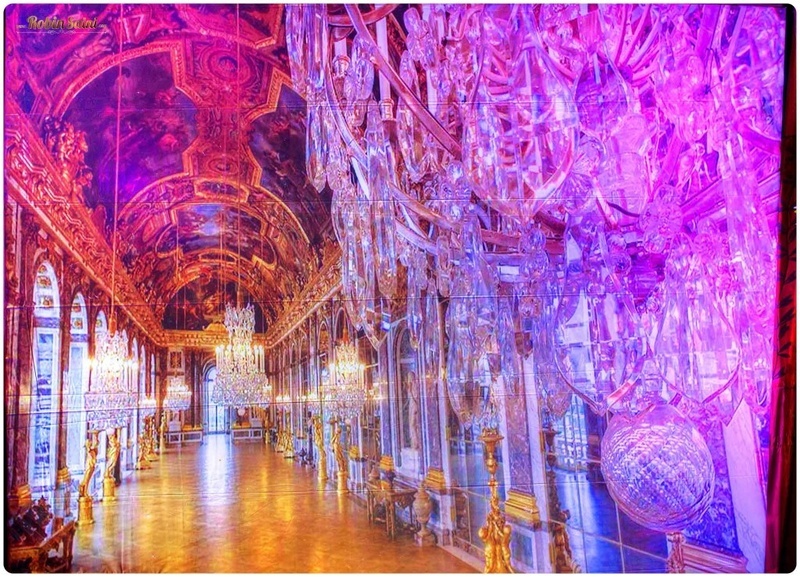 The décor too, was just plain breathtaking! 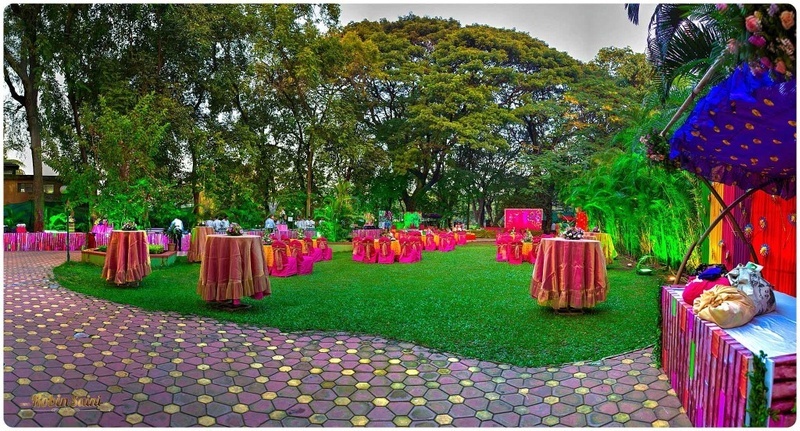 Loads of pink, yellow and orange with accents of green made this function one like we’ve never seen before. 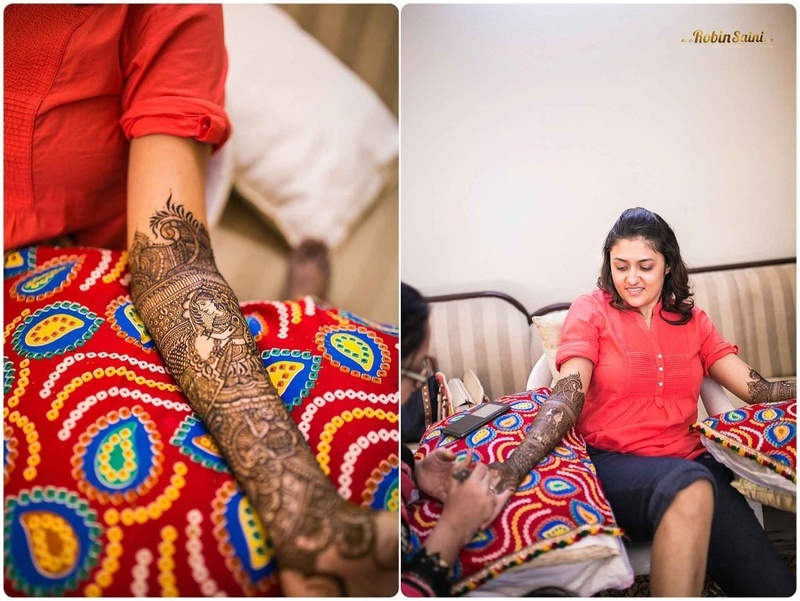 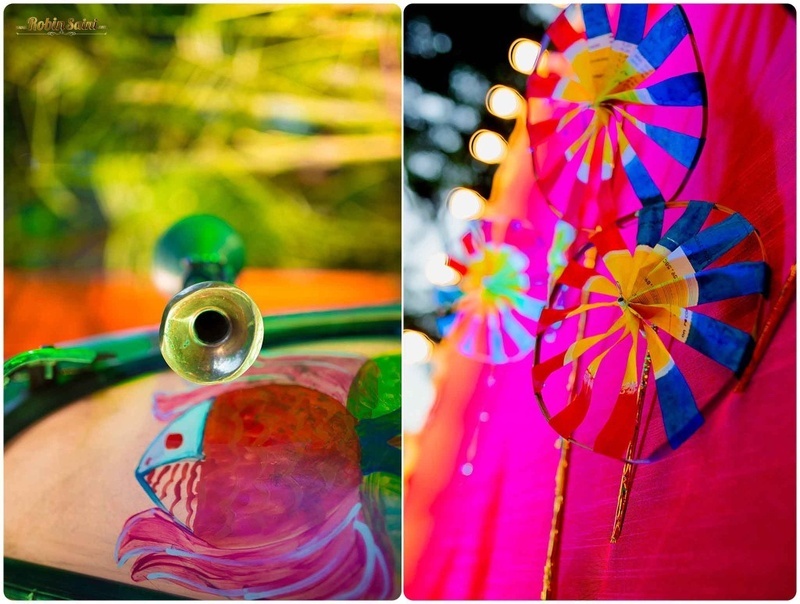 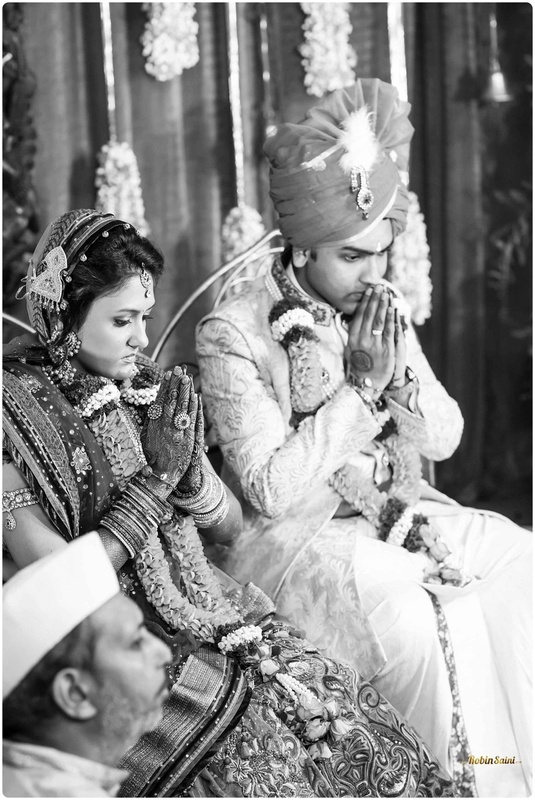 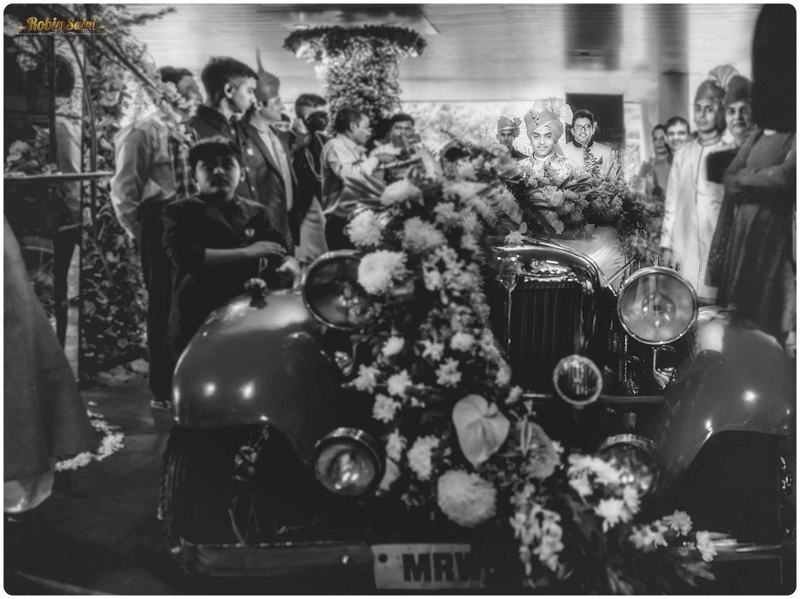 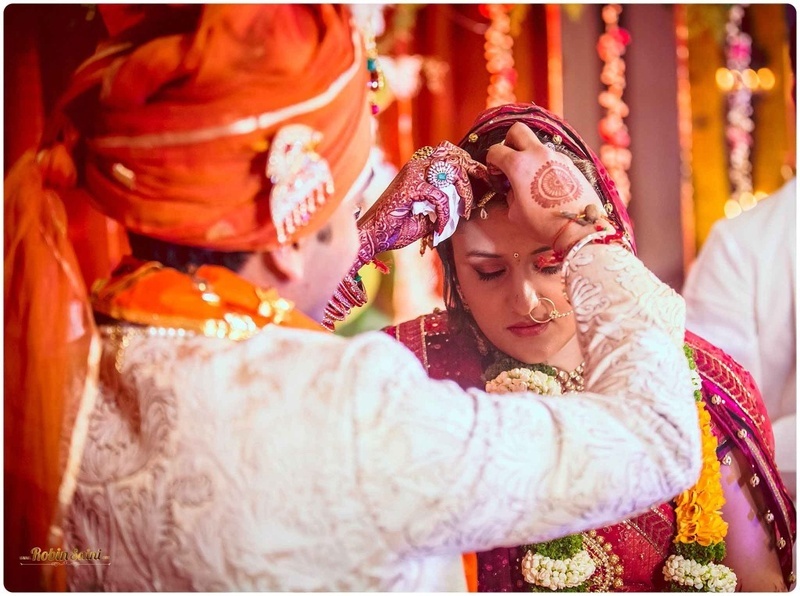 And talking about unusual, quirky ideas for your mehndi, this couple went all out with the eccentricity factor. 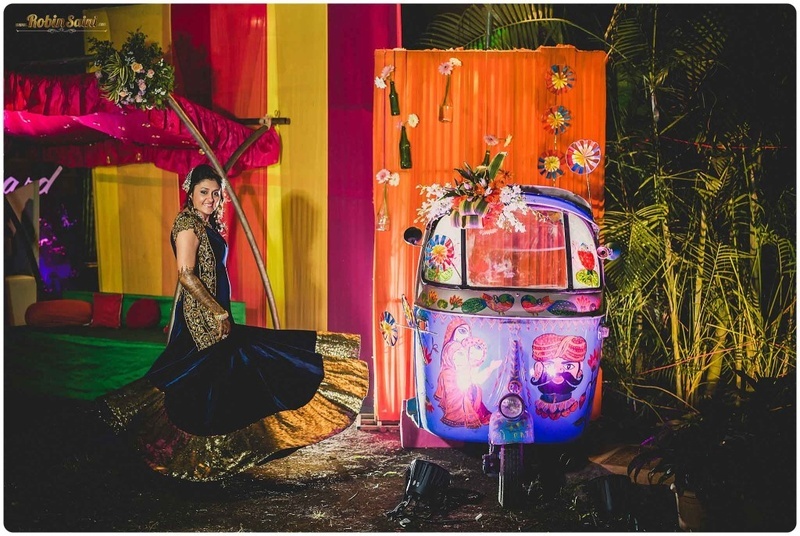 They hired a caricature artist and opted to make an ethnically painted rickshaw a backdrop for photos instead of a photobooth. 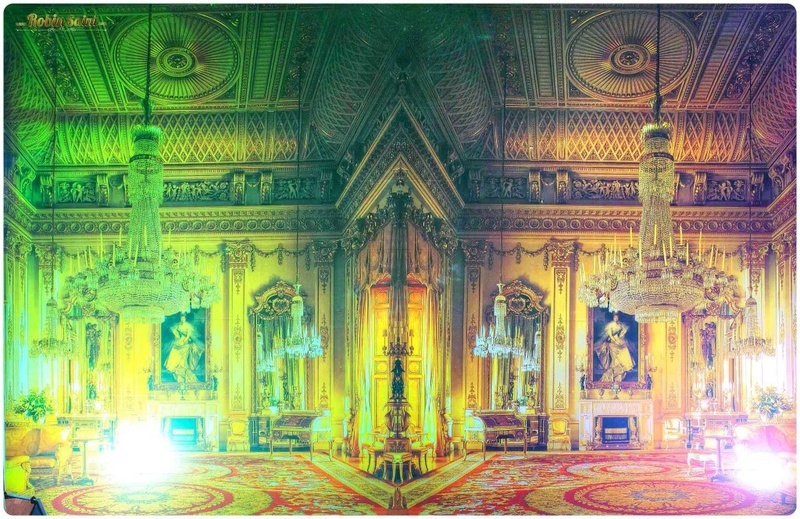 The grandiosity and fun only went uphill from here. 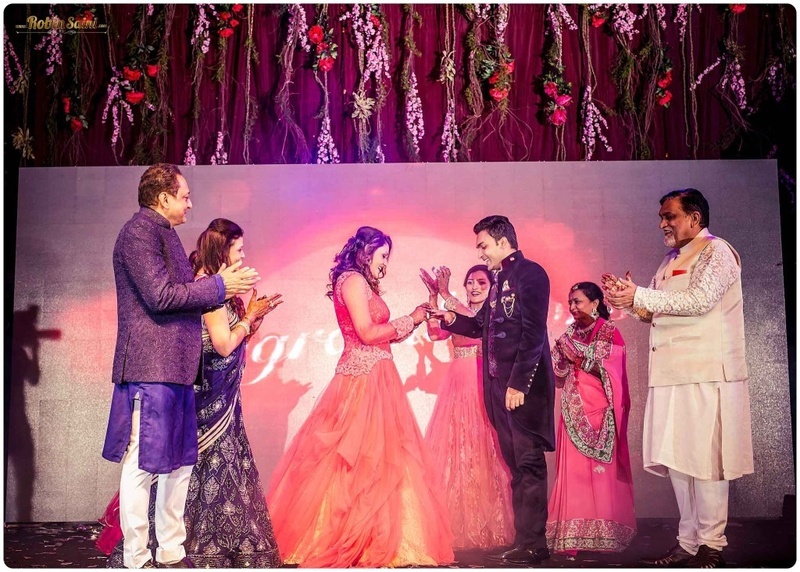 Festivities continued with the magnificent Sangeet and Engagement ceremony. 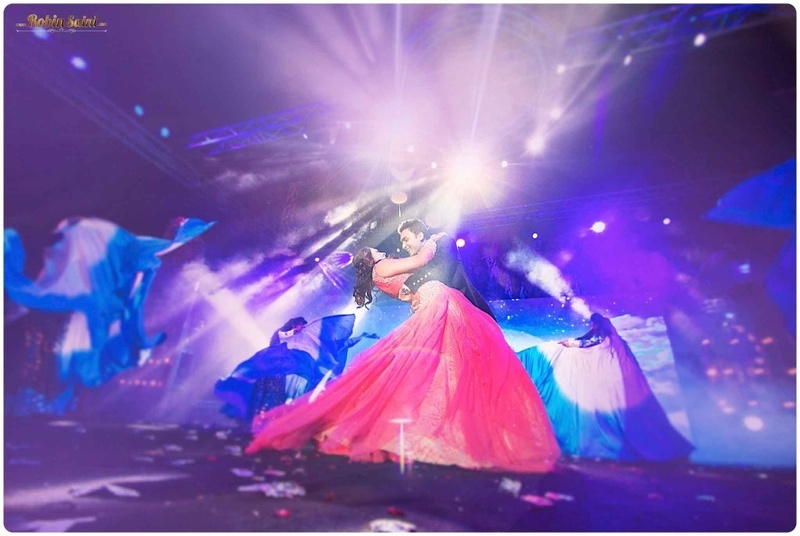 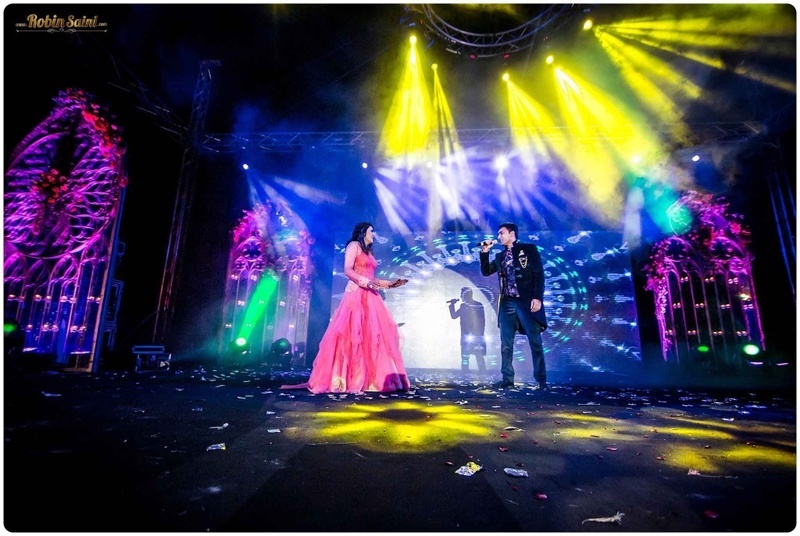 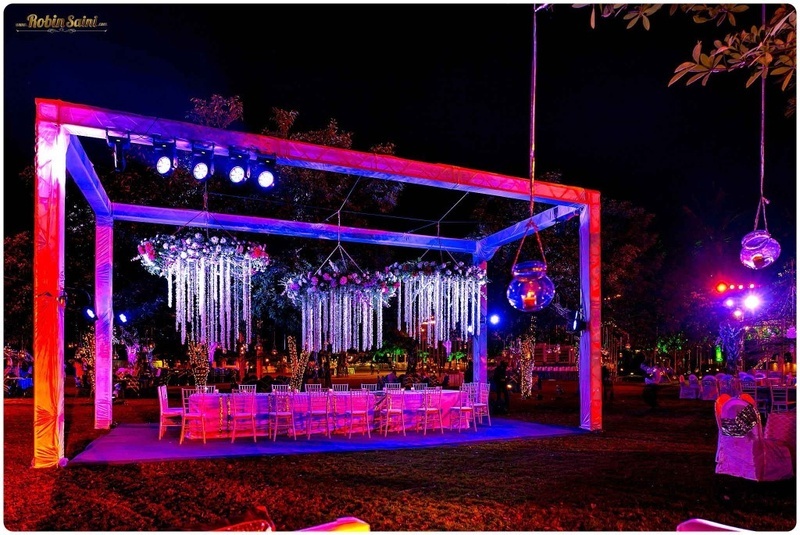 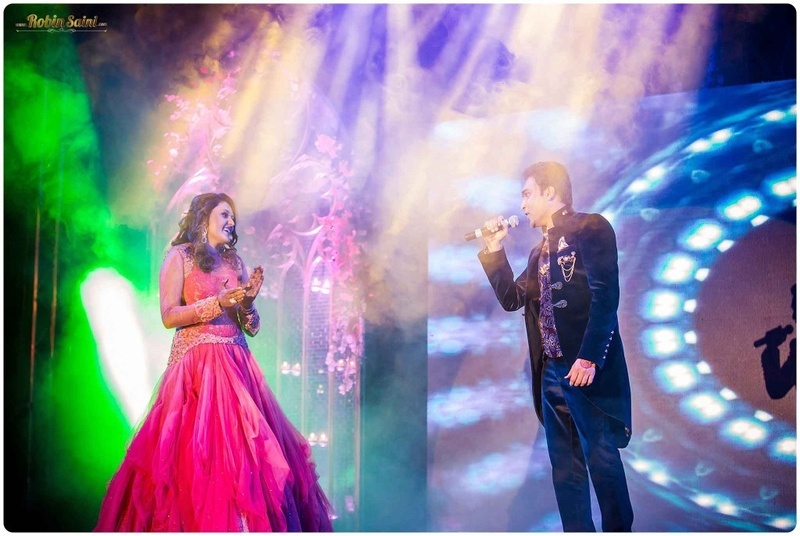 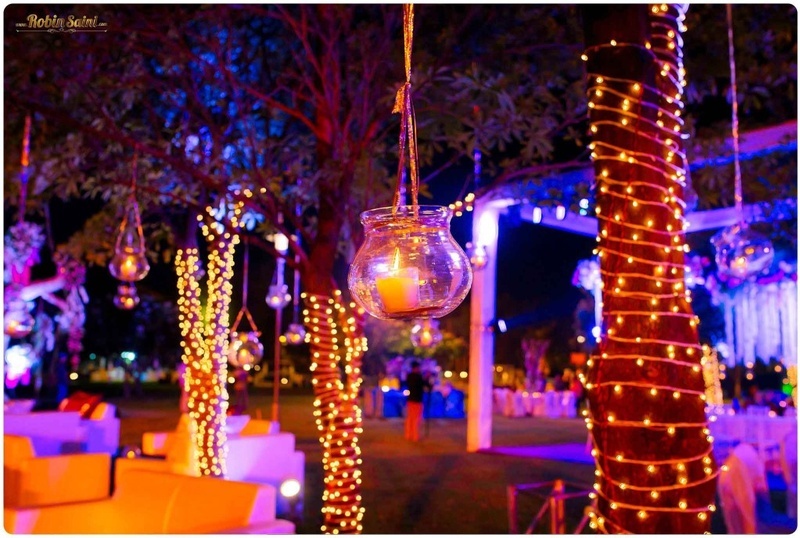 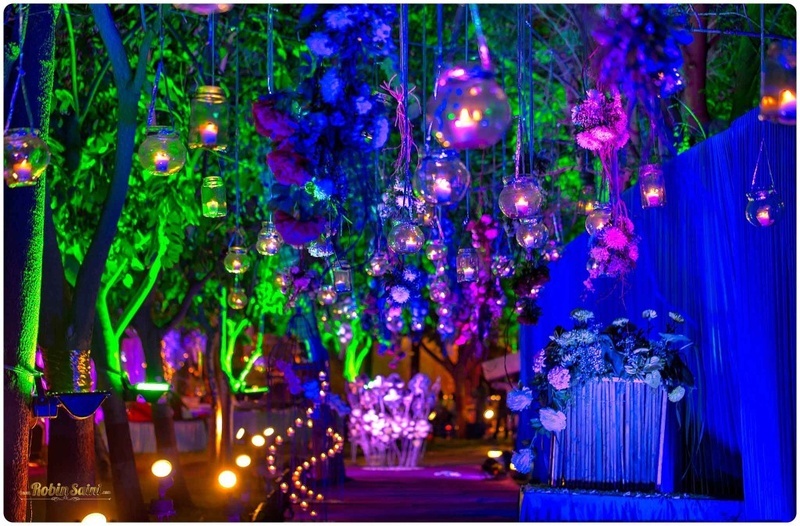 The mashup of two functions also brought with it double the fun and double the love, (the décor set-up was doubly amazing, too) Tea-light candles, fairy lights and the crystal glass chandeliers made this award night styled sangeet + engagement an extra classy affair. 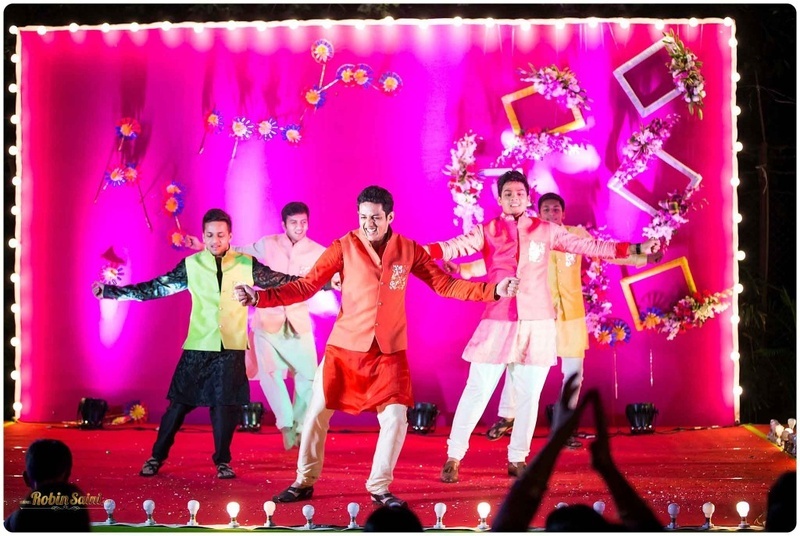 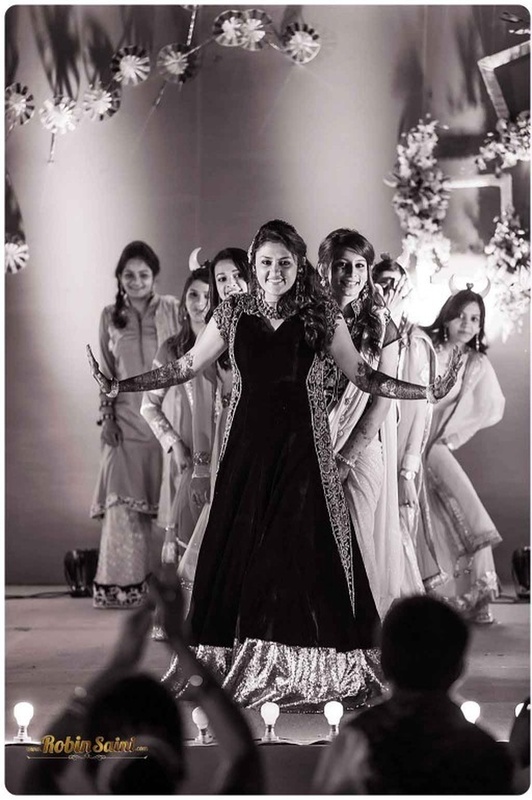 To add a Bollywood twist to this elegant evening ceremony were the back-up dancers and the gymnastic ribbon performers. 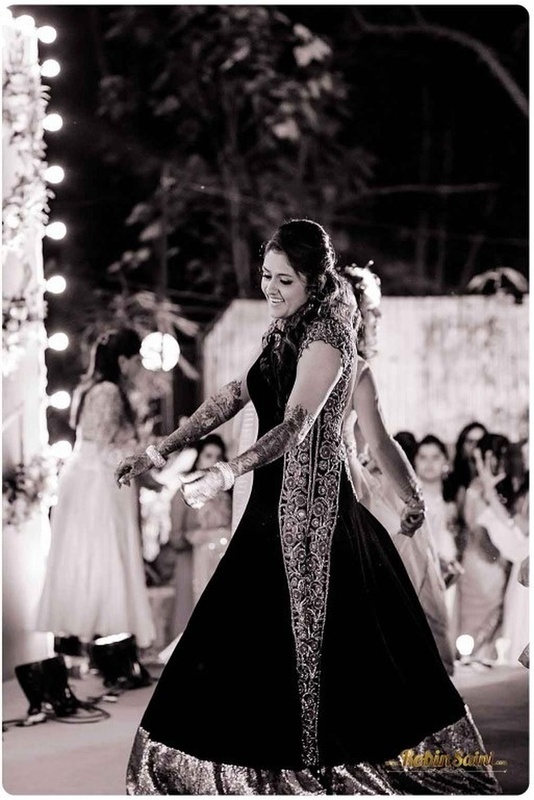 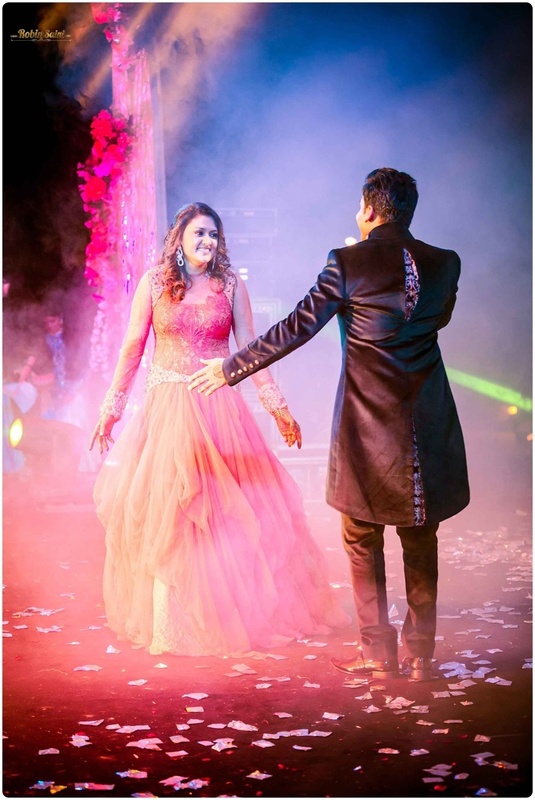 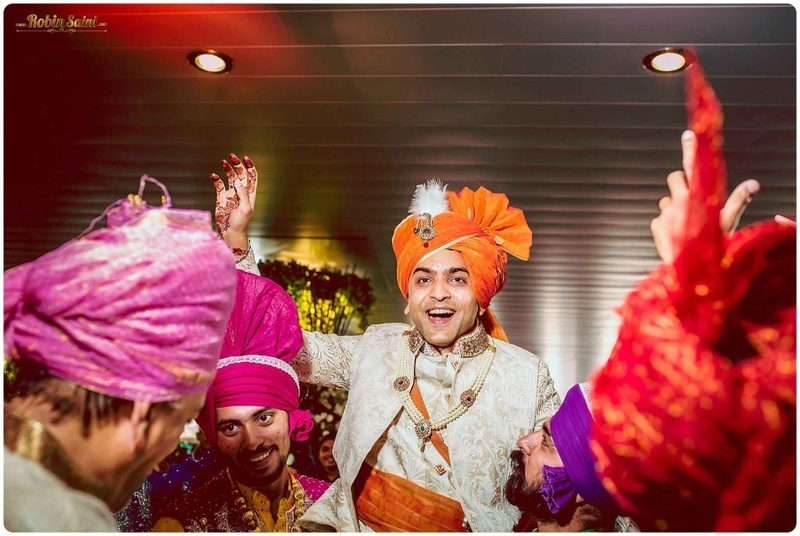 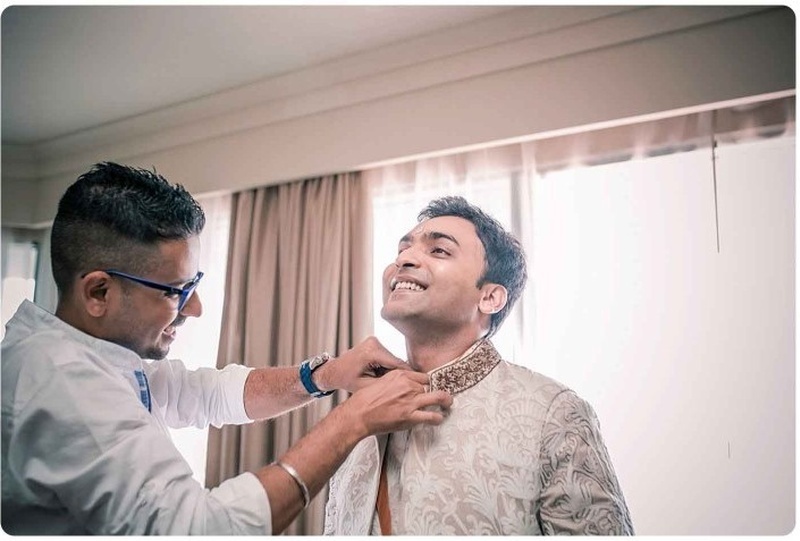 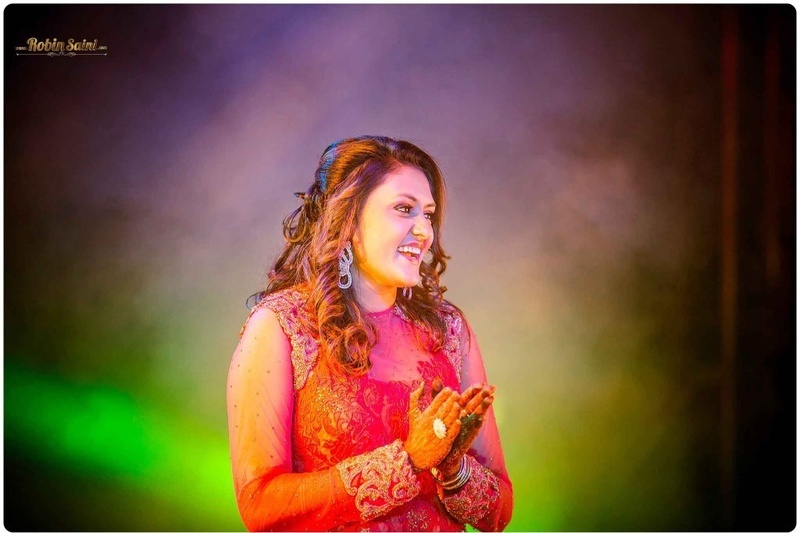 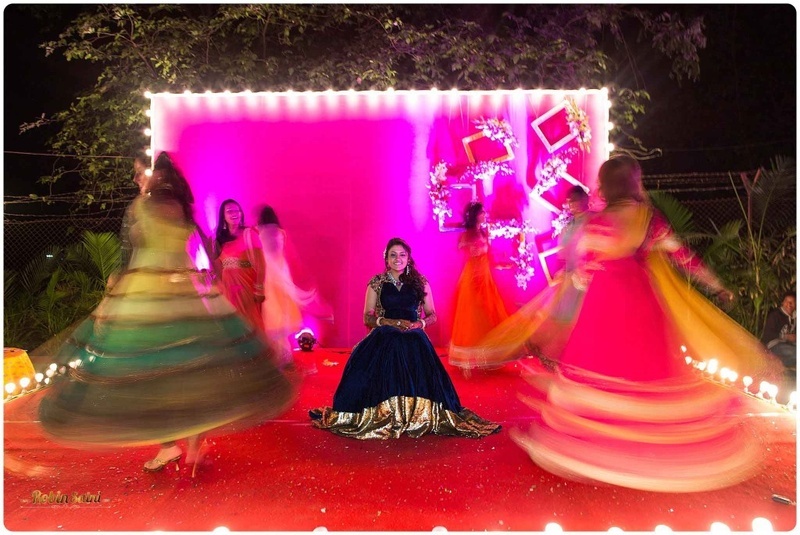 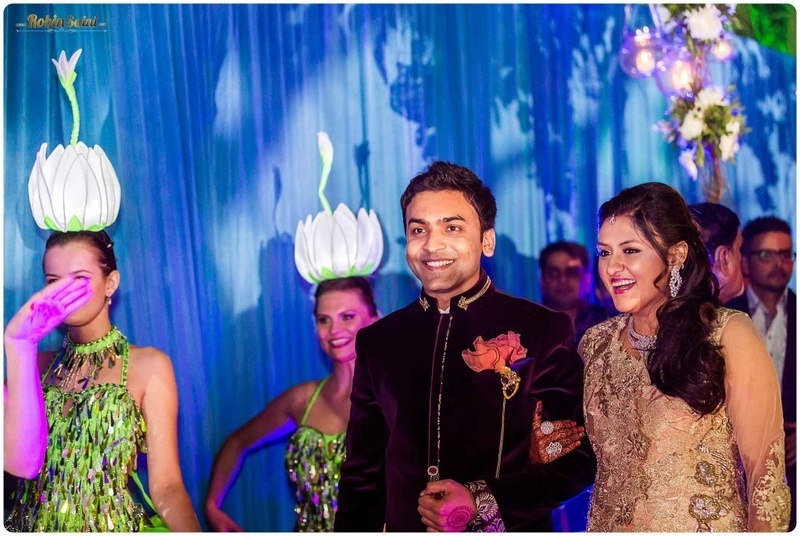 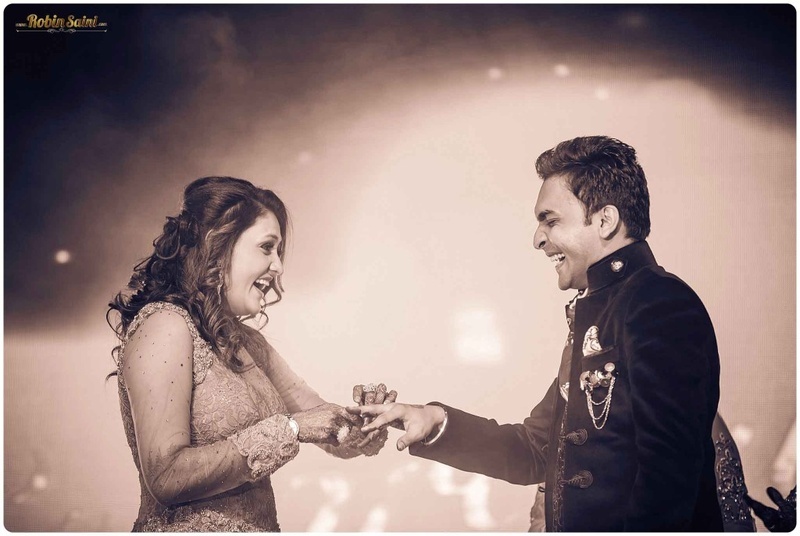 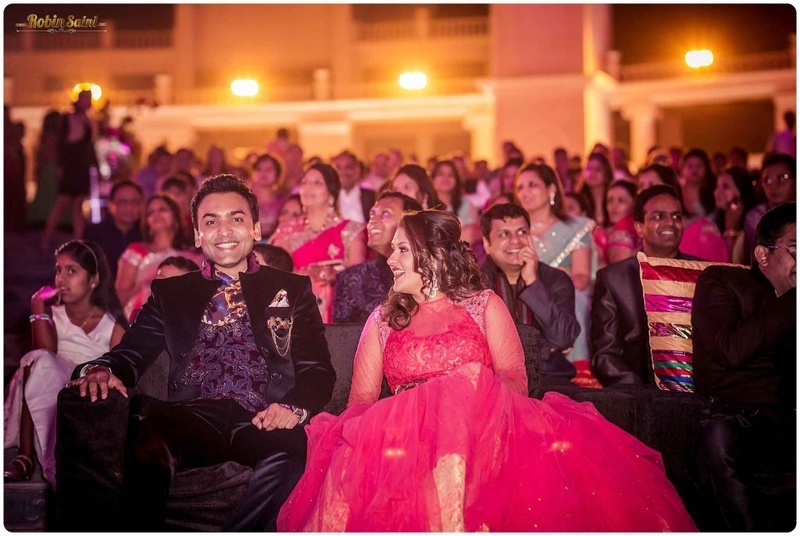 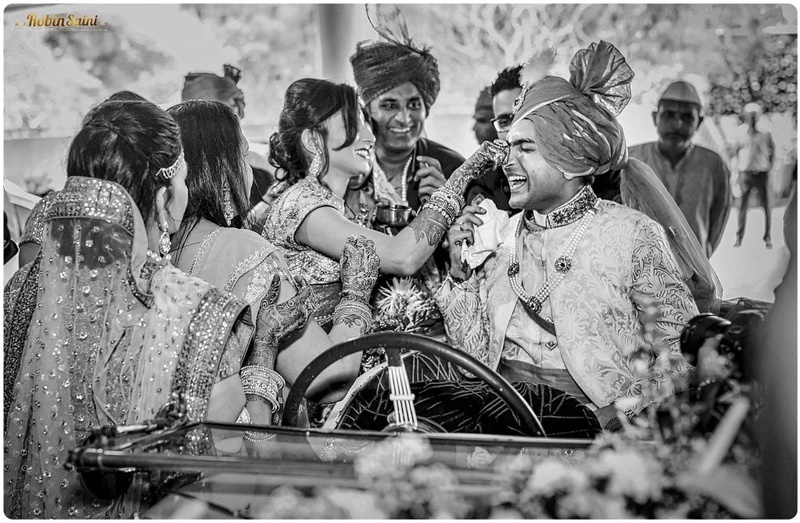 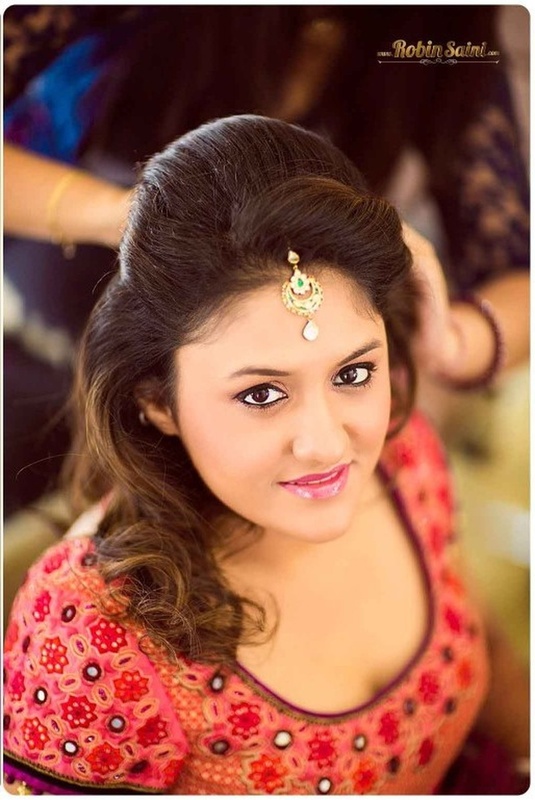 Prajal and Sunny’s wedding celebrations weren’t just about the love but there was full-focus on having a good time and making each moment memorable. 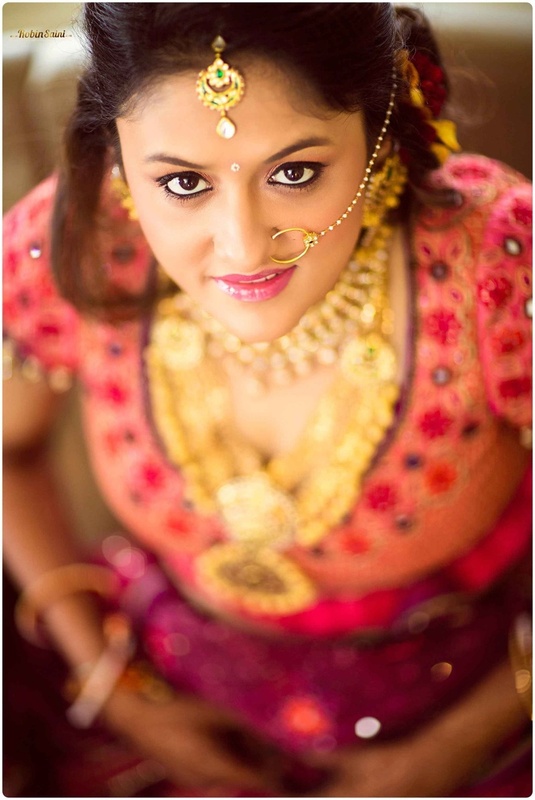 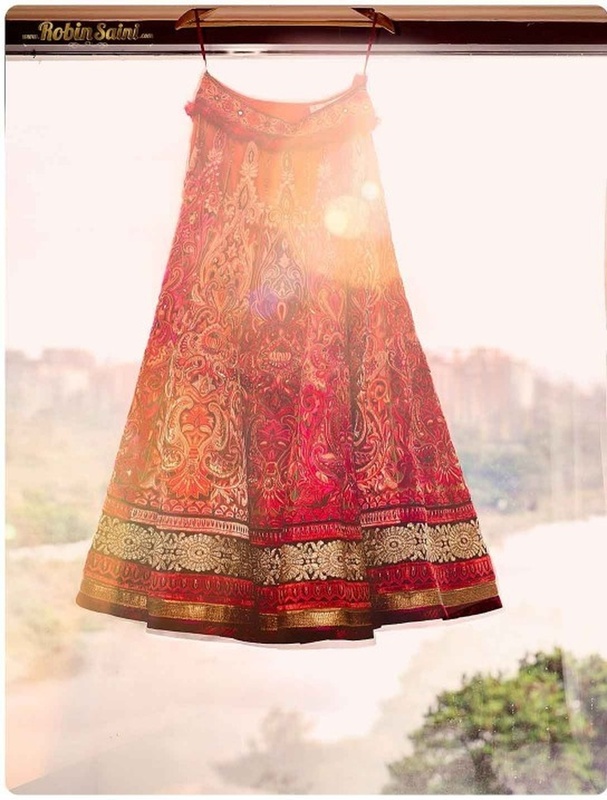 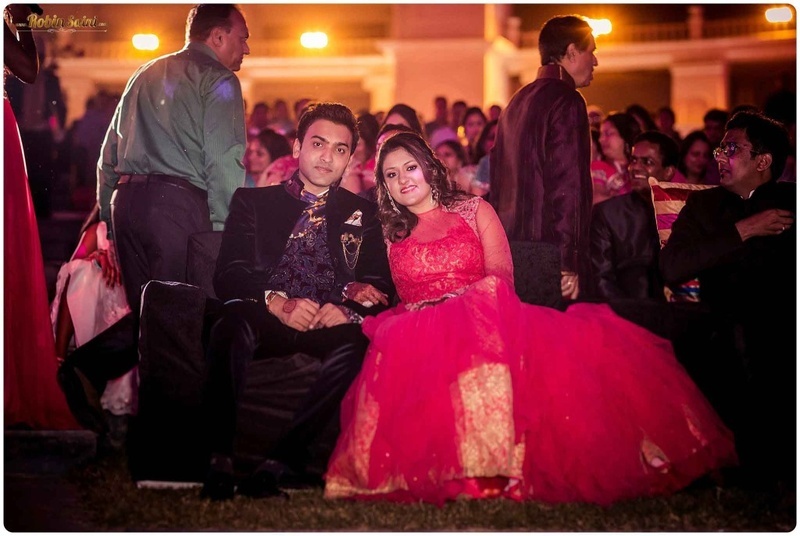 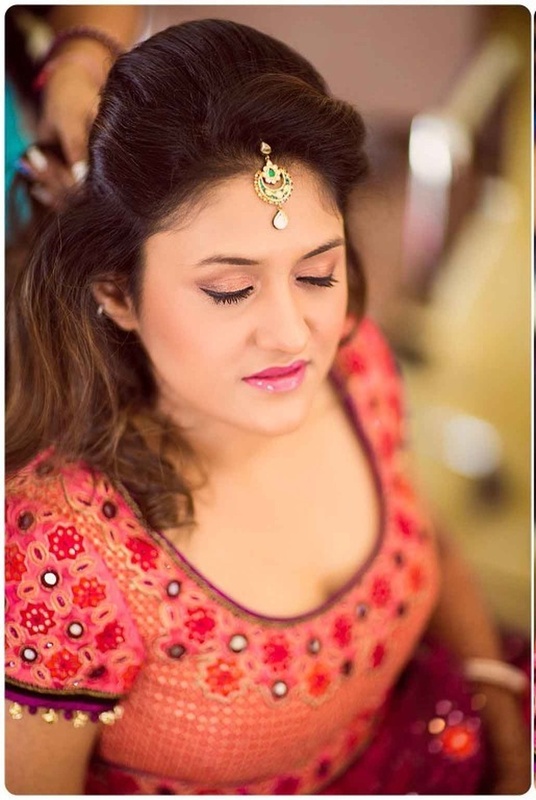 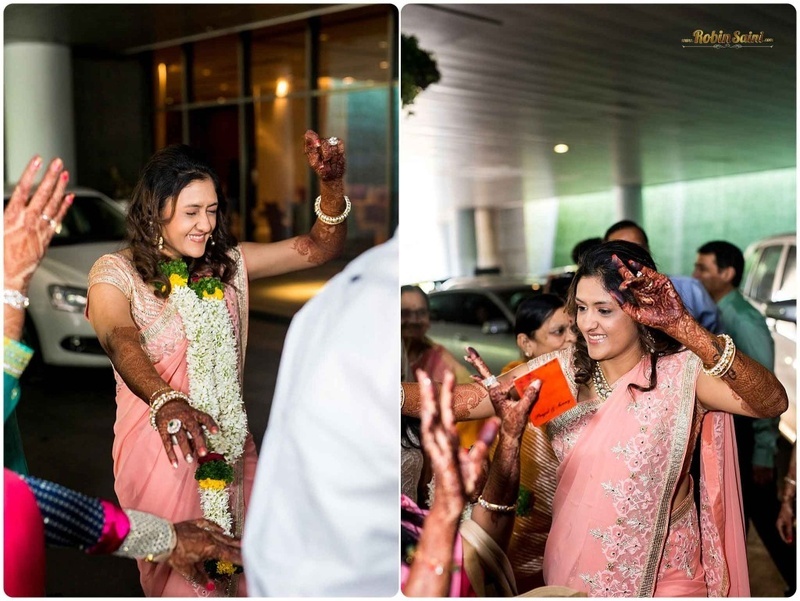 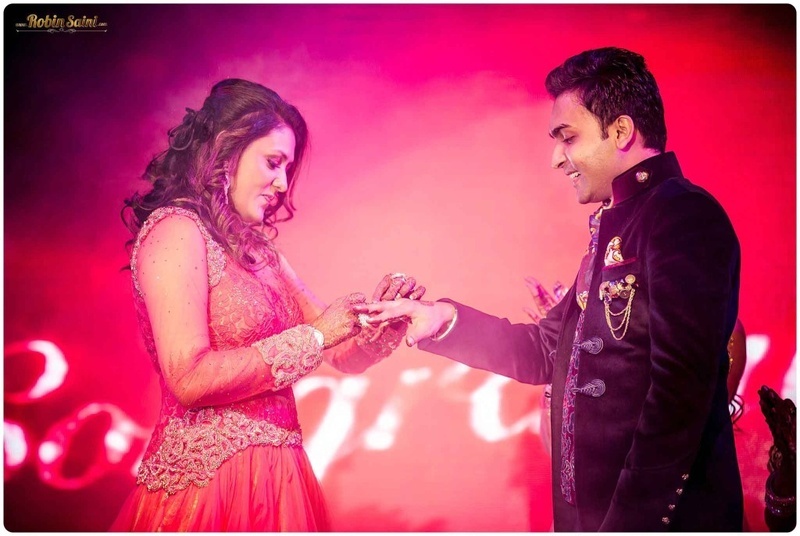 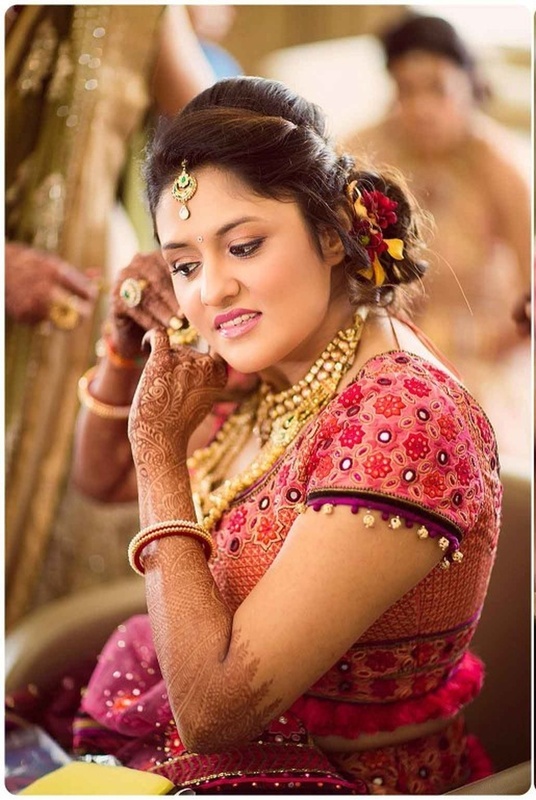 Prajal made a gorgeous bride in her pink and gold hued lehenga-choli with layered gold jewellery that left us spellbound! 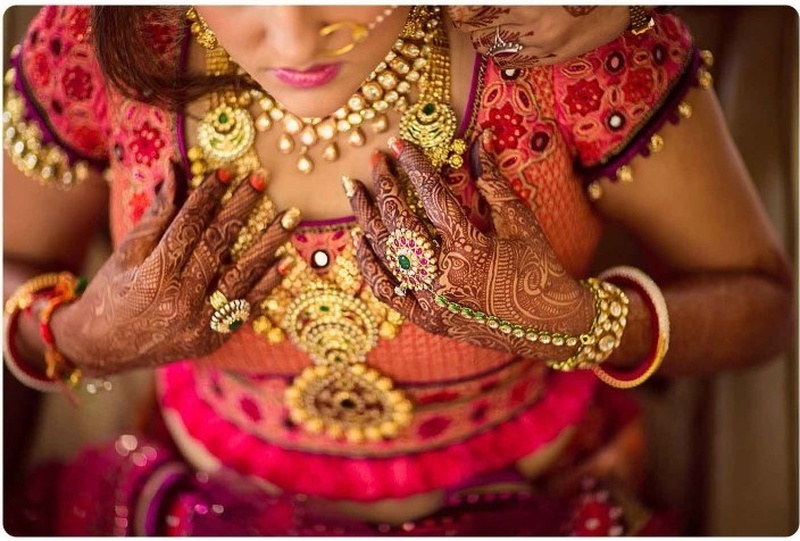 She paired a bold necklace with a delicate chaandballi maangtikka and a kundan-polki haathphool. 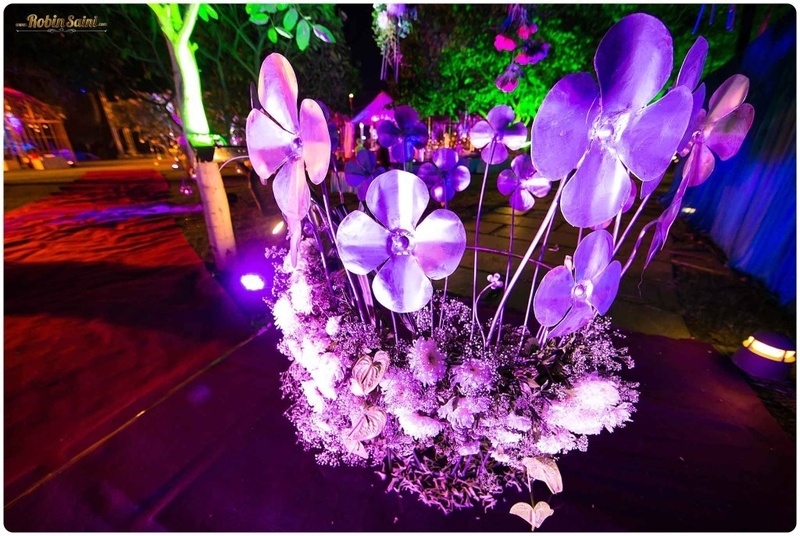 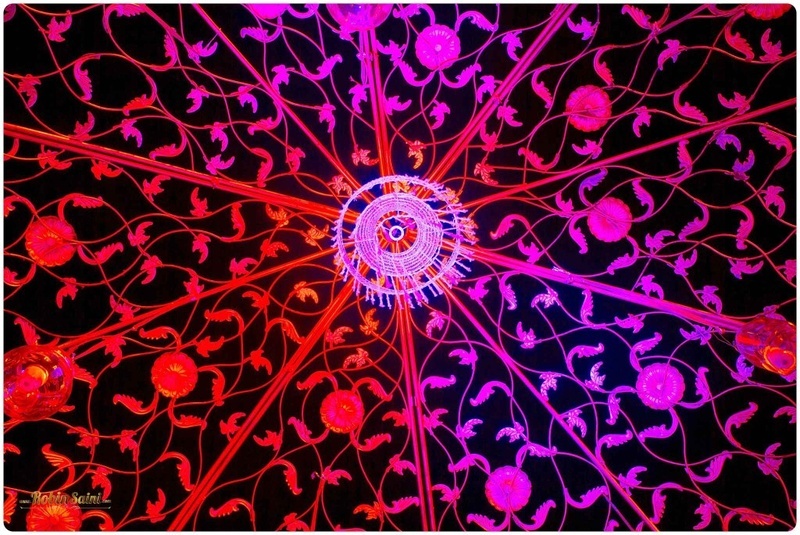 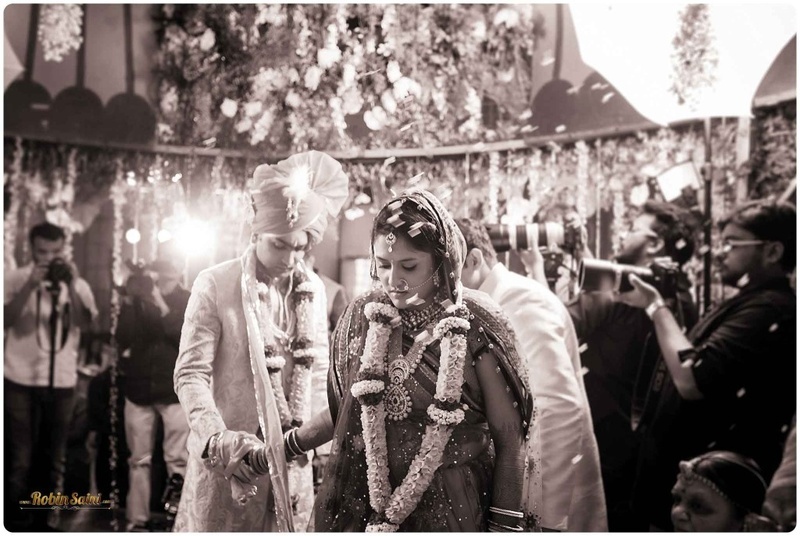 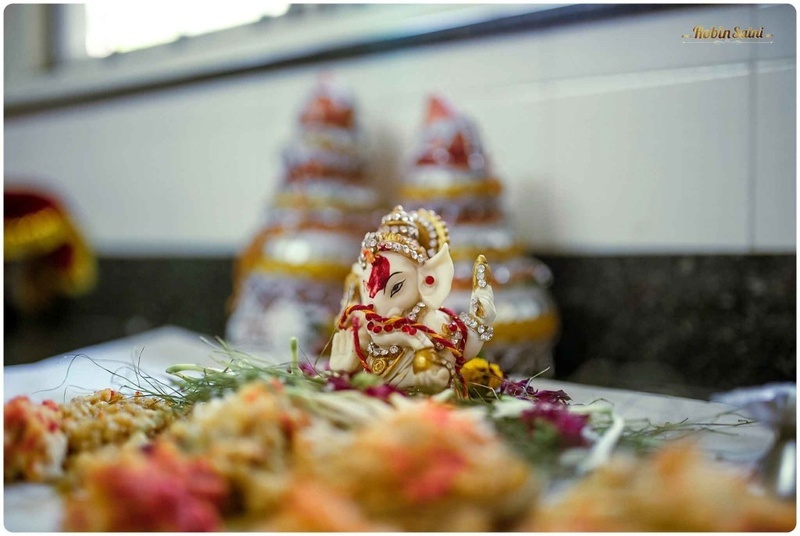 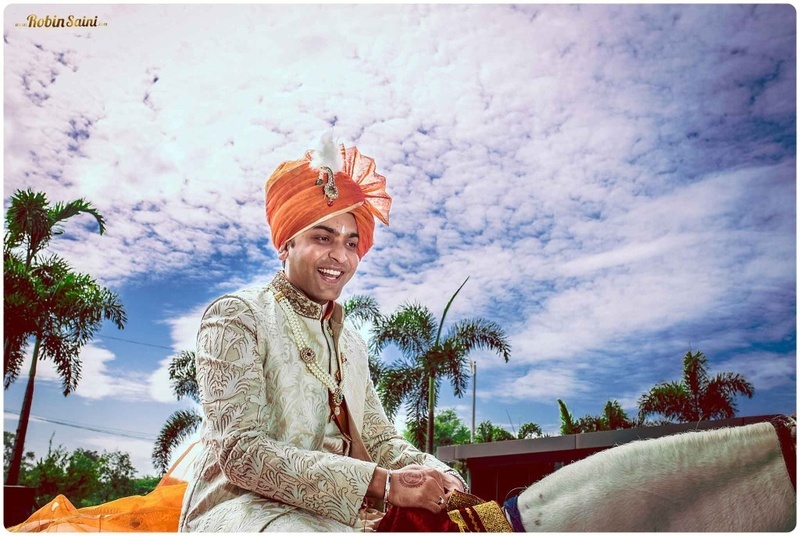 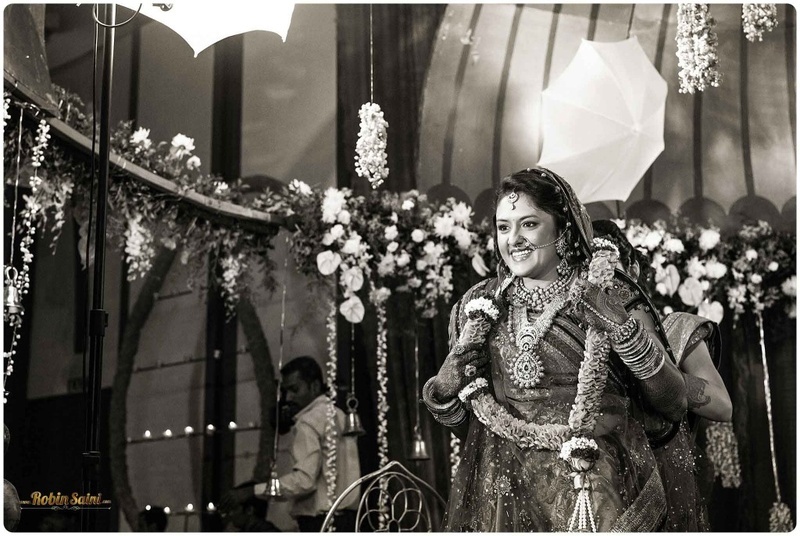 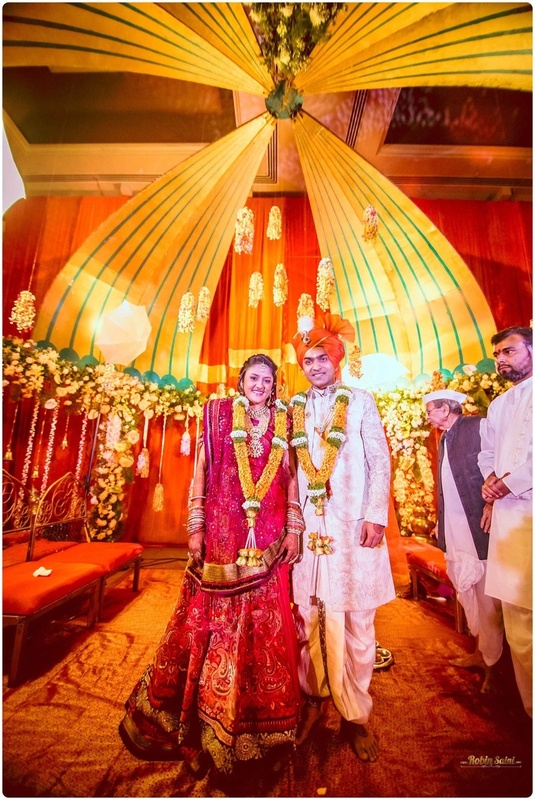 What to look out for as you scroll through this wedding album – the gorgeous floral chandeliers, the magnificent dome mandap and the tasteful table centerpieces. 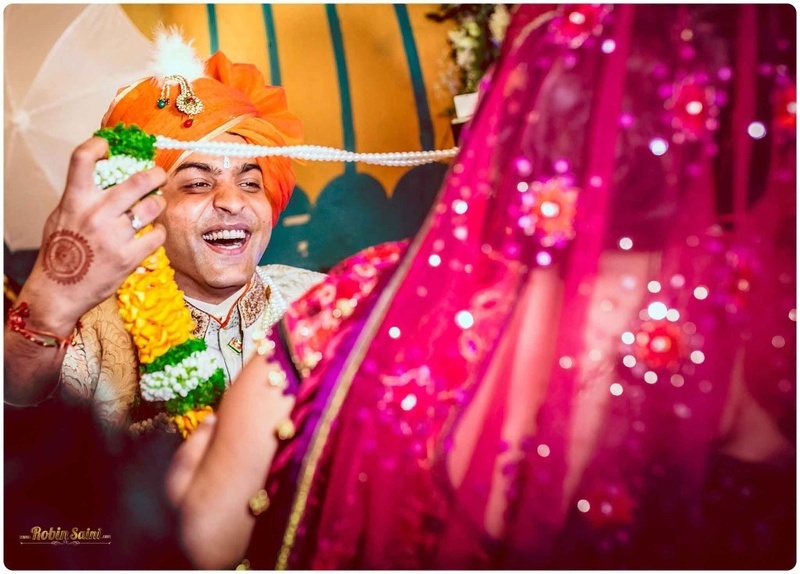 The team at Robin Saini Photography did an excellent job in capturing Prajal and Sunny’s marriage in all its fun, love and true grandiosity. 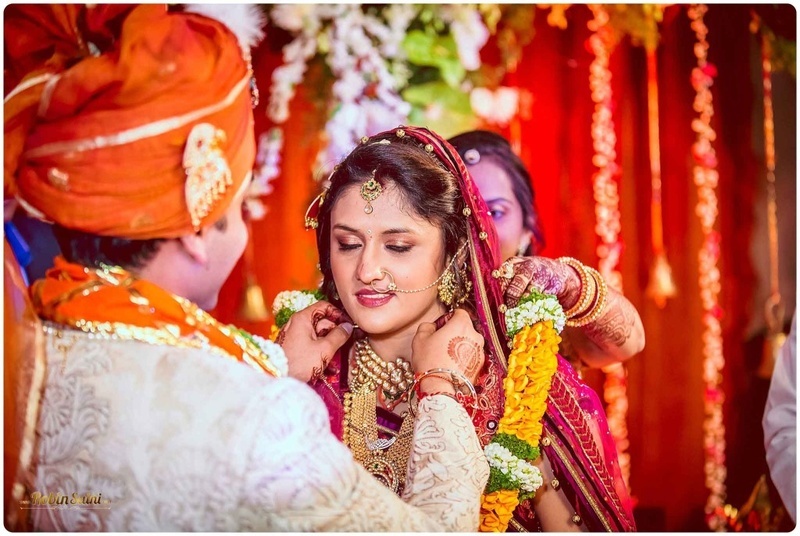 Shooting everything from table settings, to the breathtaking décor to the sweetest candid photographs of the bride and groom – the team did a flawless job!